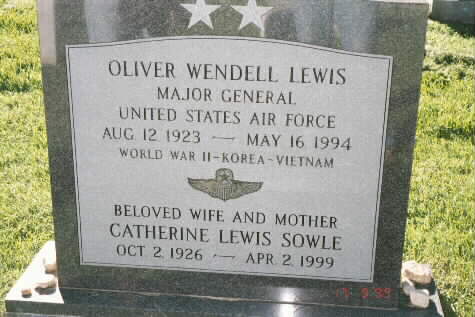 Oliver W. Lewis, 70, a retired Air Force major general who was vice president of the American Defense Preparedness Association, died of cancer May 16, 1994 at the hospital at Andrews Air Force Base. He lived in Arlington. 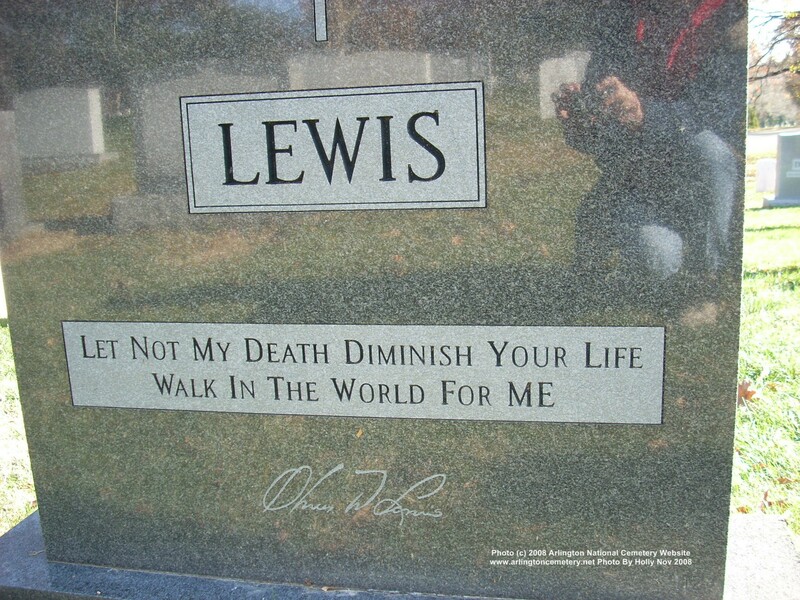 General Lewis began his military service during World War II, when he was a bomber pilot in the Pacific. He later served in Japan, in Korea during the Korean War and in Thailand and Vietnam during the Vietnam War. A resident of the Washington area off and on since 1953, he served in research and development assignments at the Pentagon and commanded four squadrons and four bases. After he retired in the mid-1970s as director of the Air Force Personnel Council, he was vice president of the defense association until 1992. General Lewis was born in Knoxville, Alabama. He attended the University of Alabama and was a graduate of George Washington University. His military honors included two Distinguished Service Medals, the Legion of Merit, the Bronze Star, the Meritorious Service Medal, two Air Medals, three Air Force Commendation Medals and two Army Commendation Medals. He was a member of the Army Navy Country Club. Survivors include his wife of 48 years, Catherine T. Lewis of Arlington; two children, Air Force Lt Col Gregory W. Lewis of Montgomery, Ala., and Kathy L. Leighton of Herndon; and four grandsons. Major General Oliver W. Lewis was director of the Secretary of the Air Force Personnel Council, Washington, D.C.
General Lewis was born in 1923, in Knoxville, Alabama, and graduated from Greene County High School, Eutaw, Alanama, in 1941. He attended the University of Alabama until he entered the military service in December 1942. He was commissioned as a second lieutenant and received his pilot wings upon completion of flying training at Altus Army Air Base, Okla., in 1944. During World War II, he trained in B-17, B-24 and B-29 bomber aircraft. In July 1946 General Lewis went to the South Pacific area where he served as a B-17 and B-29 pilot, aircraft maintenance officer and staff officer. From September 1948 to August 1949, he was a training command instructor pilot at Perrin, Texas, and then Williams Air Force Base, Ariz. During this assignment, he was an instructor in the first jet trainers in the U.S. Air Force, the F-80 Shooting Star. In August 1950 he was assigned to Headquarters Far East Air Forces and flew 27 combat missions in the B-26 bomber aircraft during the Korean War. In December 1951 he was transferred to Headquarters Japan Air Defense Force in Nagoya, Japan, where he was a project officer in the Office of the Deputy Chief of Staff for Air Installations. In July 1953 General Lewis was assigned to the Office of the Deputy Chief of Staff, Development, Headquarters U.S. Air Force, Washington, D.C., where he served four years in research and development. General Lewis attended The George Washington University in Washington, D.C., from July 1957 to October 1958 and graduated with a bachelor of arts degree in business administration and advanced management. He next went to Altus Air Force Base, Oklahoma, and was assigned to the 96th Air Refueling Squadron. There he became a KC-135 aircrew commander and later the squadron commander. After a tour of duty as chief of operations in the Atlas-F strategic missile unit at Altus in 1963, General Lewis was assigned from January 1964 until July 1965 as commander of the 26th Bombardment Squadron, which was equipped with B-52E aircraft. In July 1965 he assumed duty as deputy base commander and later was commander at Grand Forks Air Force Base, North Dakota. During this period, Grand Forks Air Force Base became a Minuteman II operational base. General Lewis went to Southeast Asia and assumed command of the 355th Combat Support Group at Takhli Royal Thai Air Force Base, Thailand, in April 1967. He was reassigned in July 1968 as commander of Norton Air Force Base, California. He went to Scott Air Force Base, Illinois, as wing commander in August 1969 and became deputy chief of staff, personnel, for Headquarters Military Airlift Command in April 1970.
the majority of matters referred to the council; advises the secretary, chief of staff, and directorates of the deputy chief of staff, personnel, of personnel trends and recommends policy action when appropriate. General Lewis was promoted to the grade of Major General on Sept. 20, 1972, with date of rank July 1, 1969. 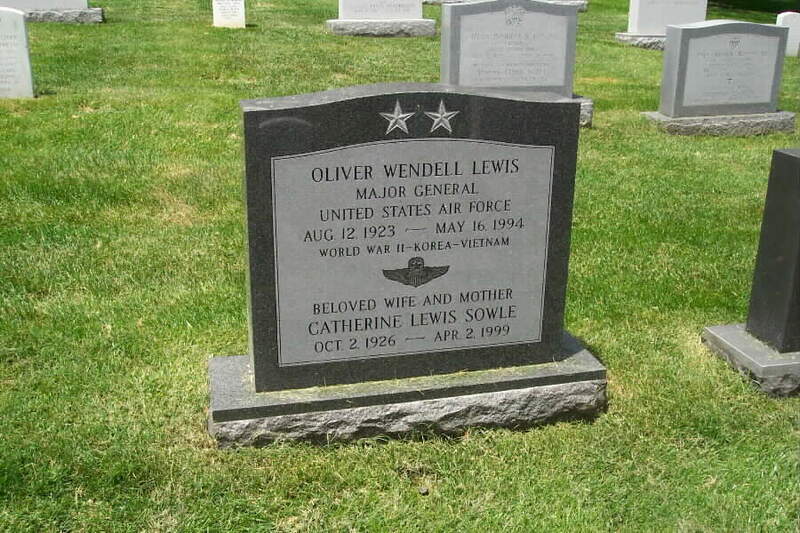 General Lewis was buried with full military honors in Section 7A, Grave 112, Arlington National Cemetery.